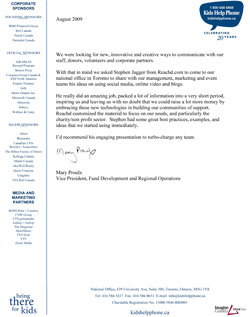 "Stephen spoke to NAWBO-LA (National Association for Women’s Business Association, Los Angeles Chapter) in November 2011. We are an organization that strives to bring excellent educational programs to our members. Stephen’s presentation was honest and to the point. He was able to cover numerous online tools and everyone walked away with something they could use to help run their business more efficiently. We hope to have Stephen come back and present again to our organization and appreciate his knowledge on what can be an overwhelming topic." 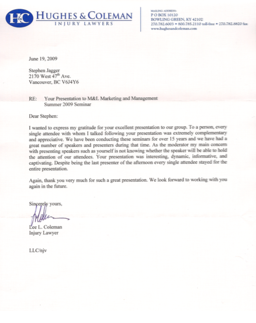 "We had Stephen speak to our group in September 2011 and he was great. Our chapter has a full complement of internet entrepreneurs and they are a hard group to impress. I had uniformly high praise for the quality and practicality of Stephen’s talk. Everybody went away with some ideas on what to improve in their companies." "I was introduced to Stephen through one of our planners who had seen him speak at a local Advocis meeting and was completely pumped after hearing him. My partners and I met with him prior to booking him for our Fall Symposium and I would have to say, we learned more about social media in a 40 minute chat than I think we could have in weeks of research. Stephen just delivered the keynote address at our fall meeting last week and he knocked it out of the park. The beauty of his message is not only the information about social media tools and where they fit, but the examples of how individuals have used these tools to get outside the box in order to create amazing businesses as well as internet “stock” in themselves. Our planners were buzzing after the meeting and many have already jumped in having been on the sidelines for too long. I would highly recommend Stephen to any organization looking to understand and successfully implement a social media strategy." "Hi Stephen. Hope you are well. Below are the comments from our on-line survey that was sent out after your event. Thought you might like them. I have tabulated your speaker rating to be 8.3 and will put this into our EO Global "Speaker Database"." Thanks again for coming to Edmonton! 4	Old school event, short and sweet, great information without the dog and pony show. 5	Were some good learnings. 6	Great venue, good parking and private for our group. Stephen had some cool tools that he uses that can be applied to any business. 7	Knowledge and years of experience of the speaker. Lots of great stories,examples and usefull tools to help me understand todays web technology. 10	The content was useful to the membership as this is what we will be dealing with in the future. 11	Very good information. Eye opener. "I am the Learning Chair for our local EO Chapter in Edmonton and had Steve come speak. There is a lot of pressure on the Learning Chair to deliver a calendar with speakers that are not only dynamic but deliver "real world" practical knowledge. Man did Steve deliver. Both myself and our members were surprised and intrigued when he shared his story of converting his "brick and mortar" businesses into "virtual" businesses with offices globally, mostly using free or inexpensive tools available on the web. He shared those tools with us and helped guide us through simple actions we could take now to use them in our business. He was every bit as good as I had hoped." "Thanks Stephen for a wonderful and engaging presentation. Not only did you show us the tools to improve our businesses bottom line, but you were able to explain how we can implement, and why we should use them. I know we all left with renewed excitement and enthusiasm for how we can immediately begin to improve, and in some cases reshape our businesses. Thanks again Stephen." "Thank you so much Stephen for your remarkable presentation! Your expertise will help our industry members get to the next level of success within our businesses. Some great new marketing ideas for branding our businesses in such a way that will separate us from the competition! I highly recommend your presentation to any and every business owner who is looking for new and "free" ways to market and grow their business! Thank you!!!" "Thank you for the great presentation at our Spring conference. 180 of our 230 salespeople showed up to see you and none were disapointed. I am on twitter now.......and looking forward to the future." "Thank you Stephen for coming to our AGM as our Keynote speaker. We asked you to focus on not only what Social Media was but how a REALTOR® could apply it in their business and you more than delivered. Your presentation was educational, dynamic, accessible and engaging. I only wish that more members had been able to attend. But for those that couldn’t we’ve recommended that your book – Sociable – should be a must read. Hope to work together again in the future." "Stephen’s vivacious style coupled with his extensive knowledge of Social Media provided BCREA’s instructors with a customized, informative and dynamic presentation. His enthusiasm for Social Media engaged the audience and opened our minds to the innovative and hands-on ideas introduced. The crowd loved him and we would welcome him back! "We recently had Stephen Jagger address our group of international business development representatives. They are a diverse group with a wide range of skill sets and comfort levels with the use of social media as a marketing tool. Stephen made the concepts exciting and accessible to all of us. By the end of the session the skeptics were leading the charge saying we need to be in this space. High energy, out of the square positive thinking … everyone in business needs to hear this message." "Many thanks for presenting your Social Media seminar to members of the Real Estate Board of Greater Vancouver last week, hosted by the North Shore/Sunshine Coast/Sea to Sky Division. Your insightful knowledge not only quelled some fears and mitigated some misgivings of this evolving technology but opened some eyes a bit wider to its productive potential to the professional community of realtors and their clients. Much HOMEwork lies ahead!" "Stephen provided our EO Winnipeg chapter with one the most powerful session in years. It’s not theory – he gives you insight to how he runs his business leveraging technology and social media in his own businesses. I have had great success in implementing some of his strategies into my business. " Since we met at Raging Bean last summer we have gone virtual (Oct 1st) using Skype Video, MobileMe (server), and iChat Video, and more recently Yammer. It's been an amazing experience and it's saving us $7,000+/month. Thank you for taking the time to share with me your success going virtual and the tools you were using. "Stephen Jagger recently spoke with the Winnipeg Chapter of EO and in 17 years in EO, I have yet to see our members take so many notes. Using technology (most of it free) in a powerful way to allow his companies to work better, market better, service better and improve profitability. If you haven’t seen Stephen, see him. It will save you money, or make you money, or most likely both! "I attended the Entrepreneur Organization's Global Leadership Conference (GLC) in Hong Kong where Stephen Jagger was the speaker. Stephen spoke about using online tools to cut costs and expand business. I am a person who really likes practical and easily implementable ideas and Stephen delivered. I thought the content was applicable to all types of business - so much so, that I hired Stephen to deliver this talk to my EO chapter in Omaha, Nebraska. " "As Gone Fishing Consulting enters into 2010 we are setting up to launch our first online software service. Steve Jagger has played a very important role in both the roll-out of our social media campaign and our day-to-day operations. The advice we received from Steve has improved our inter-office communication, our monthly bottom line and how others view us online. Steve receives my highest recommendation for his no fluff approach to business and his quick and easy solutions." "Stephen Jagger was referred to us for our 4th year of the Birthing of Giants program that we held in New York on June 26th - 27th 2009. Stephen's talk on "tools to cut costs and grow your business" was relevant and timely for our event. 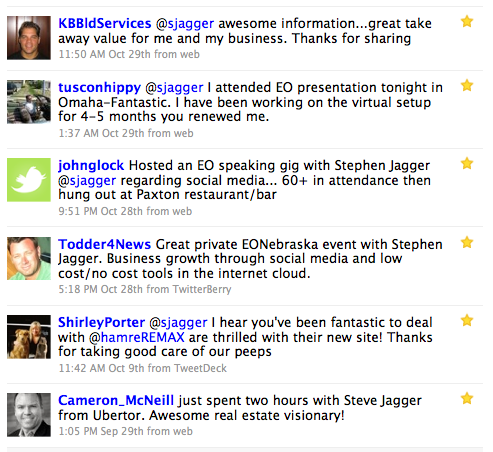 The feedback from the EO Members in attendance was fantastic rating him 4.5 out of 5. His talk was not only unique and relevant but it included real life examples of how these tools are used within Stephen's businesses. I would recommend Stephen Jagger as a speaker to any chapter interested in providing quality content delivered with real life examples from an entrepeneurs point of view." "Steve visited our chapter and spoke during an evening event full of EO Members, spouses, and guests. The take away value was incredible. He spurred a lot of ideas on technology innovation and its application to everyone's existing business as well as introduced us to Social Media ideas to consider. He was extremely knowledgeable and spoke from experience, which is the EO way. The following day he provided a half day workshop for those that were interested in learning more about Social Media. The feedback from that was terrific as well. Everyone left with their heads spinning with ideas. I would highly recommend Steve for any chapter looking to increase their knowledge of technology and social media with their businesses."